Family fun event from 10.00-1.00 pm on Saturday 25th August. Make this part of a fun-filled day. 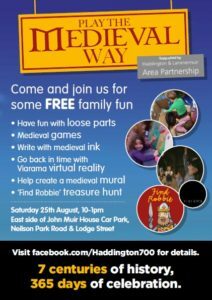 Set up your Garvald Show exhibits on Friday night or Saturday morning at the village hall, pop down to the Haddington 700 Medieval Play event, then return to Garvald Show for the pet show, prize winner announcements and tea and cakes in the orchard! This entry was posted in Events on August 19, 2018 by Admin.